Festive season has caught up worldwide. Now, a few of the current ATP Tennis stars have lent their voices to one of the most famous Christmas carols, Rudolph the Red Nose Reindeer, in a funny video, released by ATP Official. The players were clearly in a jolly and festive mode and displayed their funny sides as they tried to sing Christmas carols. They were also seen in traditional festive attire, wearing Christmas sweaters and fancy caps. Top tennis players like Roger Federer, Novak Djokovic and Andy Murray among others, sent in the season’s greetings, wishing fans worldwide, as others like Gilles Simon, Borna Coric, John Isner, the Bryan brothers, Horia Tecau and doubles partner Jean-Julien Rojer, Bernard Tomic, Jamie Murray, Jack Sock, Dominic Thiem, Grigor Dimitrov, and Marcelo Melo were all involved in singing the carol and greeting fans in a humourous fashion. 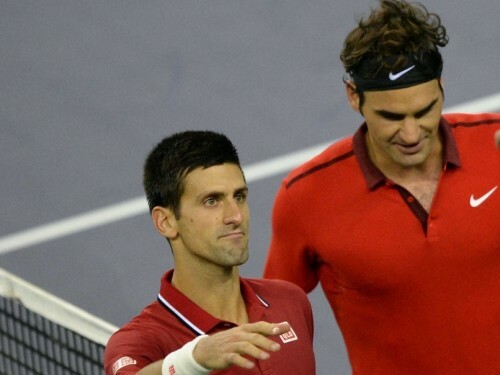 Murray and Djokovic tried their hand at singing, as Federer cleverly resorts to just wishing. Towards the end, his compatriot Stan Wawrinka and top-10 Japanese star Kei Nishikori too drop in, to wish fans. Rafael Nadal was conspicuous by his absence, but the other aces in the video certainly made up for it!